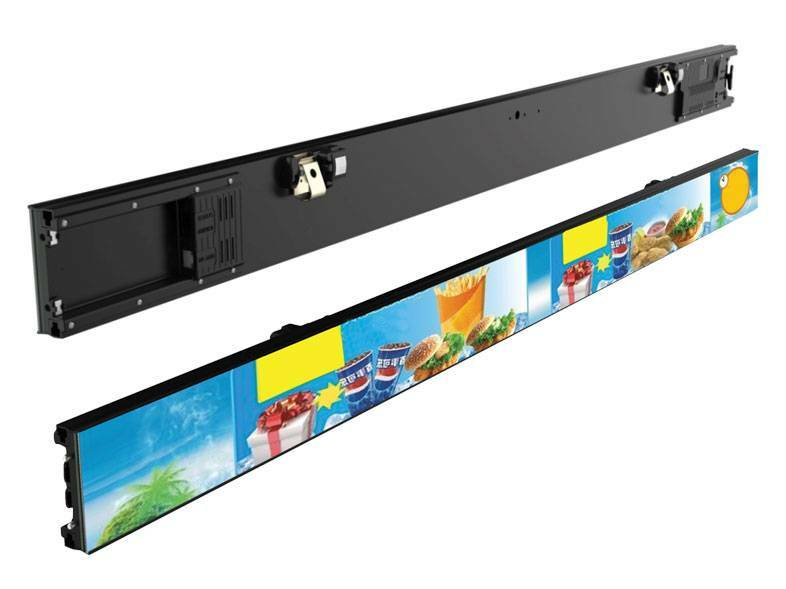 Titulus is designed mainly to be used as a full colour LED display for shelves. Now you can play videos and images on the shelves and get the attention of the customers. It can also be used for advertising to promote the products on the shelves. In order to play high resolution content, Titulus has super-fine pixel pitch. 2.11mm pixel pitch for the base and 1.9mm on the vertical axis. Its special design and light weight let the product to be installed easily on shelves with clamps. The access for maintenance is made from front. Titulus has external power supply to save space on the installation spot of the shelves and the display size can be as long as the shelf. Moreover it comes together with a protective anti-glare glass in the front. 2.11 mm pixel pitch on base, 1.9mm pixel on vertical axis. 1216x82mm ( width by height) cabinet size. Complete with protective, anti-glare glass. 320W average power consumption per square meter. Only 4 cm cabinet thickness.